Executive producer Julian Beak has a lot to say about his time at Visceral Montreal. 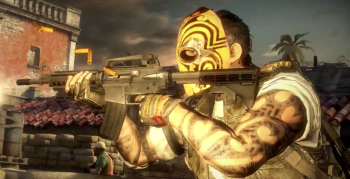 Army of Two: The Devil's Cartel executive producer Julian Beak has poured scorn on Visceral Games Montreal's work culture, and says that the "underwhelming production" was predictable. In a LinkedIn CV update, Beak says he was brought in as a morale troubleshooter, "recruited late in development to nurture the team." While Beak claims success, he admits it came too late to salvage the project. So how did Beak not-quite-save the title? Hard work and "the frequent celebration of success" says he, which should give you an idea of what life might have been like at Visceral Montreal in the pre-Beak era. He also says he "modeled and coached honesty, tenacity and commitment at all levels." But in any event, the team wasn't going to be around much longer. Visceral Montreal shut in February 2013, in a move parent company EA's Frank Gibeau described in a company message as 'Transition is Our Friend.' Devil's Cartel launched in March, to lukewarm reviews.